Each year when we visit Filippo Rizzo of Lamoresca at his farm in San Michele di Ganzaria in Sicily, we look forward to having him cook for us. 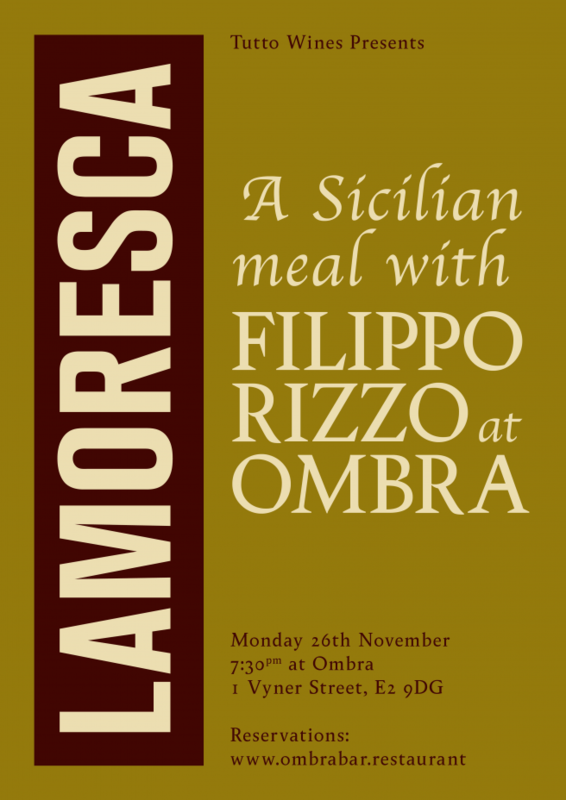 On Monday 26th November joining his childhood friend, chef Michele Triolo, along with Ombra’s own Mitshel Ibrahim in the kitchen at Ombra for a dinner celebrating Sicily, its recipes and the ingredients from the Lamoresca farm. Guests will be welcomed with antipasti at the bar, before sitting down for Spaghetti di Gragnano al sugo Lamoresca, pork cheeks braised in Mascalisi and, for dessert, cannoli filled with persimmon and chocolate from Modica. The whole range of Lamoresca wines will be available by-the-glass and bottle, with Filippo on hand to guide you through each.